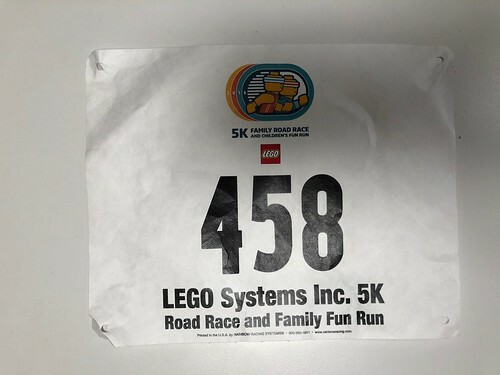 The LEGO 5K at the company’s US headquarters in Enfield is notorious for selling out very quickly, because it’s also known for having some of the best race swag around, if you’re into toys featuring DC Comics and Ninjago characters. I knew I wanted to do it once, and it finally worked out this year. When we actually ended up there, among the crowds, the bags of swag, and the fancy t-shirts, the race seemed almost incidental. The whole family came for the race, and Grace was excited to run with me. She had just done a 5K in Woodbridge less than a week before, which went well, but involved quite a few breaks, walking, negotiating how long we were going to run before resting, and so on. This race was a different scene altogether: she was amazing. We ran a nice, steady pace, and ran 1.7 miles before even talking about a break, which ended up lasting about 5 seconds. She was really strong throughout. We took three small walk pauses, none longer than ten seconds. She made a great strong finish over the last two tenths, and a set a new PR again. I was so proud of her consistency, her drive, and her fortitude. She did great.